Alvarez Gomez Agua de Colonia, Eau de Cologne, a fresh, clean and natural-smelling cologne enhanced with essential oils of the Mediterranean. 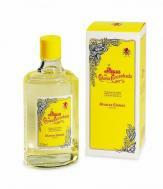 Lemon, rosemary, geranium, Spanish lavender, bergamot; it is all here in this quintessential Spanish fragrance. This is a pour bottle, not a spray. Alvarez Gomez Agua de Cologne Natural Spray, made for over 100 years in Spain, is the quintessential Spanish fragrance based on Mediterranean plants, herbs and flowers. Lemon, rosemary, geranium, bergamot and Spanish lavender. Clean, fresh-smelling, refreshing and perfect for both men and women. Alvarez Gomez Agua de Cologne Refreshing Wipes, scented with the famous Agua de Colonia fragrance, these are perfect for travel, gym bag, car or pocket for a quick, refreshing tune-up during the day! Made in Spain! Alvarez Gomez Agua de Cologne Roll-On Deodorant is an alcohol-free antiperspirant, extremely subtle yet highly effective. Made in Spain. Alvarez Gomez Agua de Colonia Scented Candle is made with natural wax and essential oils with the base-notes of lemon, sandalwood and cinnamon. 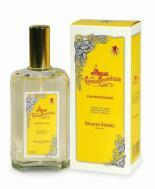 Alvarez Gomez Liquid Soap with pump, scented with the famous "Agua de Colonia" fragrance! Perfect for the well-appointed guest bath experience! Alvarez Gomez Barberia Eau de Colonge is a fresh and elegant masculine fragrance with citrus top notes of bergamot, lemon, bitter orange and ginger. Sandalwood and cedar are at the heart of this sensual Spanish fragrance. Alvarez Gomez Barberia shave cream in a tub is made of Argan Oil, Aloe Vera, and Cottonseed Oil, for a moisturizing, smooth shave. Scented with bergamont, lemon, and bitter orange, this cream is perfect for use with an Omega synthetic bristle shave brush. Alvarez Gomez Men's Barberia Neutral Shampoo is an exclusive pH neutral shampoo formulated with marine plankton, mint, eucalyptus, ginger and biotin. This formulation strengthens hair quality, while adding shine and vitality. A clean scent, perfect for daily use. Made in Spain. Alvarez Gomez Barberia After Shave Facial Moisturizer Plus is made with marine plankton, aloe vera, ginseng, silk amino acids and goji berries. 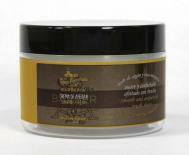 A light, non-greasy texture provides intense moisturizing, antioxidant, anti-wrinkle and cell regeneration properties. Alvarez Gomez Barberia Shave Foam is made with Argan oil, Aloe Vera and Cottonseed Oil which ensures a very creamy texture that allows the razor blade to slide easily and gives a super-smooth shave with no irritations. Alvarez Gomez Agua de Cologne Hand Cream is formulated with active ingredients such as Vitamin E, Aloe Vera and Pearl powder that protect, repair and nourishes the delicate skin of your hands. 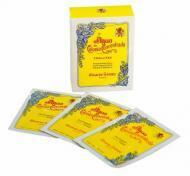 Alvarez Gomez Agua de Colonia Soap has a rich, creamy formula of glycerin and oatmeal, leaving your skin soft and smooth. Great for the whole family!